2 to 4 week delivery! The iQ-1E is an entry level scale that can weigh 5 grams to 5 lbs. of free flowing products like whole bean and ground coffee, small nuts, rice, grains, spices, small candies, teas, popcorn and similar products. The iQ-1E is our economy model that is dependable and has many benefits. No change parts needed when filling from 1 ounce to 5 pounds. Air compressor comes standard allowing for single button start-up. The load cell (the most important instrument on the scale) is sensitive yet durable. It is encased to protect against dust and water damage and has 800% overload protection. All contact parts are stainless steel. Weigh bucket disconnects easily for cleaning. Accuracy is from 0 to .01 pounds over. All controls are made from off-the-shelf parts for easy maintenance and local service worldwide. 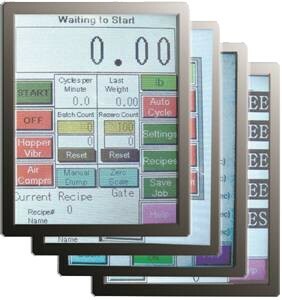 Touch screen, menu driven controls for easy set-up and multiple features including job memory storage, batch counting, auto-zero and the self-teaching feature. Need more customization or speed? Please visit our PMB Series of scales. 8 oz. to 1 lbs. 2 lbs. to 5 lbs. 3 lbs. to 5 lbs.